Hard drive geometry is the organization of data on disk platters and it decides how and where data is stored on the surface of each platter. 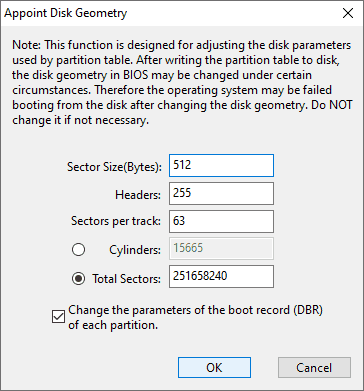 This function is used to appoint hard disk geometry such as sector size, heads, sector per track, cylinders, total sectors and boot record (DBR) of each partition. Please note that this feature configures parameters used in partition table. 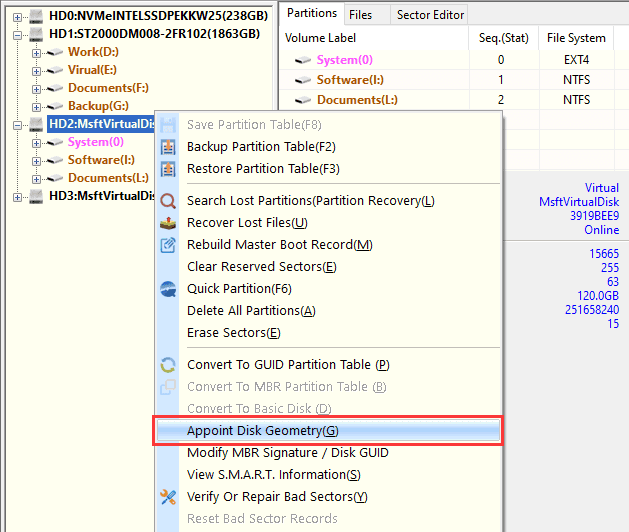 In some case, after saving partition table, disk parameters might be changed. Thus, operating system may not be able to boot normally after changing hard disk geometry. Do not make any changes if you do not fully understand this function. Step 1 Right-click the disk you want to change geometry and choose "Appoint Disk Geometry" option. Step 2 Enter parameters on the following dialog box, and click "OK".